We hope you all know already about this weekend’s seminar in Velenje and Ljubljana with Wilko Vriesman 5 Dan. Everybody should come, even beginners – your participation is very, very welcome. 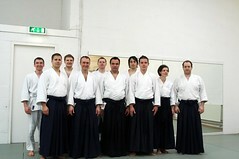 And of course participation at Aikido seminars, just like regular training, is the key to making progress. This seminar will give you wings – no Redbull necessary! There were 38 participants at the national Aikikai seminar in Ljubljana, which is very encouraging for Wilko’s upcoming seminar. Only a few regular participants were missing. Of course, the overall number could have been even higher, as will hopefully be the case when Wilko comes. Special mention goes to the eight participants from Velenje, who traveled the farthest to get here. Since Wilko will be in Velenje on Friday, we hope for a good turnout. Once again we invite everyone who’s not from Velenje to come if you can – you won’t be disappointed. And we certainly expect the tatamis to be crowded on Saturday and Sunday. Thirty participants from Slovenian Aikikai, the Czech Republic and Slovakia enjoyed a seminar with Michal Baňas from Prague. This was the Federation's first seminar with Michal, who has been practicing Aikido for 17 years and teaching in his own Dojo for over 10 years. He was also the first Aikido teacher of Aleksandr Starovojtov and Staša Pisek. During the seminar we practiced building trust between uke and tori. The training was both beginner-friendly and challenging to advanced students. More guests from EU countries will be joining us at the Ljubljana Summer School on August 23-26. 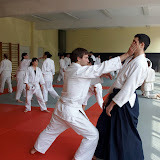 We are happy to introduce an Internet community where we can share our thoughts and experiences regarding Aikido. This discussion group is a good opportunity for Slovenian Aikikai members to communicate and network, gain knowledge about Aikido and the Federation, and help one another make progress as Aikido practitioners and as human beings. For the 7th time already, Wilko Vriesman Sensei came to Ljubljana to give a seminar - this time with an assistant, Tom Dijkman 4 Dan. Over 50 members of our federation enjoyed three days of intensive training. There was an examination at the end of the seminar, and Arsen Miloševič, Denis Zadnikar, Matjaž Žalig and Veljko Novakovič passed their 1st Kyu exam. Congratulations! A six-member delegation from Slovenian Aikikai went to Prague to attend a seminar led by Wilko Vriesman Sensei. The last time we traveled to Prague was in November 2005. 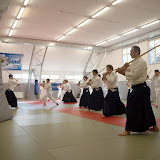 Our friends and colleagues from the Czech Aikido Federation recognized significant development in the Slovenian group. This was a great practice session. A delegation from Slovenian Aikikai presented Aikido to 4 classes (over 100 pupils) at Jesenice High School. During a workshop lasting 4 classroom hours, we explained the principles of Aikido and practiced some basic techniques. 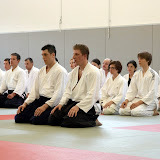 Most of the participants were excited about the ideas behind the techniques, and showed great respect for the president and main trainer of Slovenian Aikikai. For the fifth time already, members of Slovenian Aikikai attended the traditional winter school at Vriesman Dojo in Amsterdam. This year ten of us practiced for five days with over 70 Aikidokas from Dutch and Belgian Aikikai. 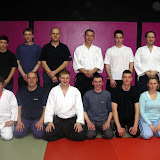 In the photo: the Slovenian Aikikai delegation with Wilko Vriesman Sensei.